Movie Review: Flipped- Rob Reiner’s Coming of Age Film Has Charm but Not A Lot of Inventiveness | Generation Film! That iridescent first love that most of us experience at an early age is unforgettably special, and while the novel “Flipped” captures that coveted relationship and the different perspectives that prevented or aided the process Rob Reiner’s adaptation of the novel doesn’t exactly match it. 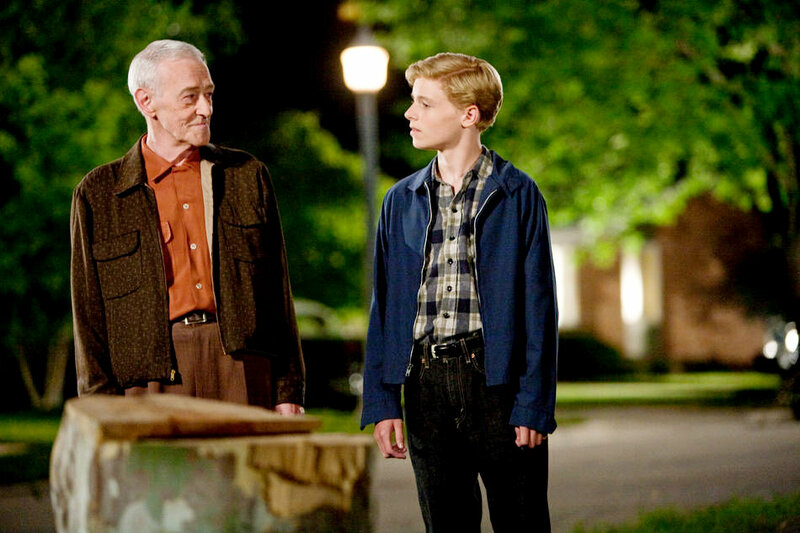 Flipped does exude that particular Rob Reiner charm, one reminiscent of Stand By Me and The Princess Bride, which provides a delightful atmosphere that can perhaps be attributed to Reiner’s familiarity with film and working with young actors. However, the constant use of droning narration and an equally pedestrian and simplistic filming style work against the on screen chemistry of the young actors. While the narration attempts to capture the essence of the novel’s original delivery it is done in a fashion that rivals the blandness of Kevin Costner in Dances with Wolves. This style might have worked in the 80s, but it comes off as slightly dated in this early 60s era love story that could have used a bit more elegance and cinematic innovation. But this doesn’t mean that Flipped doesn’t provide an enjoyable and relatable experience, because it transcends its specific time and place providing enough grasp over the insecurity of youth and an authentic tale of misunderstandings and realizations that can be relatable to most, if not all, people. Reiner hasn’t done anything notable since the early 90s, but fortunately Flipped works well enough as a coming of age tale that has something to charm all ages of an audience. Perhaps it was the shift of time setting from contemporary to the 1960s in Wendelin Van Draanen’s novel that changed the delivery in Reiner’s adaptation, but it’s clear that Reiner and fellow screenwriter Andrew Scheinman tried their best to keep the heart of the novel alive in their script. When there is dialogue and genuine interactions between the actual characters aside from the interrupting narrations it is clear that Reiner still knows how to adapt a source in tone and intention, much like he did with Stand By Me, Misery, and The Princess Bride. Flipped opens up with the two unsuspecting protagonists, an instantly fascinated Juli Baker (Madeline Carroll) and the horribly frightened Bryce Loski (Callan McAuliffe), and proceeds to tell a story of both of their perspectives on every event that helps shape their relationship or the lack of one from second grade to sixth grade. The script works best when the story focuses on the strict back and forth perspectives, or the “he said, she said” interpretations of each event, due to the authentic nature of the character’s reactions. However, when the script tries to layer in some more outside dramatic elements, such as Bryce’s father hiding something deep inside him, there really isn’t enough to flourish the side notes into more important building blocks for the film as a whole. If it weren’t for the excessive use of narration, which does have its importance in telling this particular story, Flipped would be undeniably charming. But the truth of the matter is that some people will find that type of story telling nowadays sort of lazy, while some others will find it a tad annoying. Coming of age tales are a dime a dozen these days with more and more coming out each year from both the indie scene and the blockbusters. The aura and specifics surrounding each story are, of course, different and it always depends on how detailed and genuine the delivery of the film takes. Reiner has always been a simple director, not ever venturing to experimenting angles or different lighting to portray the underlining emotion in the scene. Instead Reiner remains a basic storyteller who focuses on his characters and when the script stays focused on the two young protagonists that is when Flipped works. Cinematographer Thomas Del Ruth follows directions here nicely and replicates his simple yet crystal clear imagery that captures the innocence and uncertainty of this time in the character’s lives much like he did in Reiner’s Stand By Me. It helps that Reiner has had experience working with children because their reactions seem believable throughout the film. Not many directors can successfully work with children, M. Night Shyamalan being one of them, and Reiner proves that when he focuses on it he can make a delightful and overwhelmingly charming picture. And while for the most part everything on the surface works in Flipped it really comes down to those little problems of not developing a particular sub plot and the creative choice of using too much narration that drag the film down to a basic and average level of entertainment. While the supporting cast does a decent job of fulfilling their roles it is really the unfortunate aspect of the script that fails to incorporate them all in a meaningful fashion. Aidan Quinn as Juli’s father who struggles with his moral conscience of taking care of his mentally challenged brother and providing everything for his family is certainly a character that is complete and he does an excellent job at providing a presence. Another character that provides a complete transitional influence on both Juli and Bryce is John Mahoney as Bryce’s wise and romantic grandfather Chet. If it weren’t for the veteran “Frasier” actor giving his varying talents to the screen as the one who understands both of the protagonists and gives believable advice throughout, Flipped could have flipped the opposite way and not charmed the audience at all. Unfortunately the rest of the cast are just simply there and never provide ample reason for their existence other than being part of each of the families as to make the family dynamic at the time seem more realistic in the film. Anthony Edwards as Bryce’s father does a decent enough job with what he is given but the script implies more to his character that is never explored after it is mentioned. And some of the other child actors don’t have enough appeal as the two main actors, Madeline Carroll and Callan McAuliffe, and bring some occasional scenes down with their lack of experience. These unfortunate occurrences with the undeveloped characters along with some creative laziness (narration, simple camera work) make Flipped a dutifully charming film that borders the average coming of age tales that continue to make their way on the screen. Rob Reiner has never been an exceptional director nor have any of his films been an artistic template for filmmakers to come. However, all of his films in the 80s and early 90s gave us moments to remember, whether it was the discussion of dusting for vomit in This is Spinal Tap or Harry’s confession of what he specifically loves about Sally at the New Year’s party in When Harry Met Sally. Nothing about Flipped jumps out at you for equally memorable moments in cinematic history, which can possibly be blamed for its basic style and distracting use of narration to not allow those moments to genuinely present themselves. But as a whole Flipped does have that storytelling charm of young love that will put a smile on the audience’s face when that guiltily pleasurable last shot ends the film. With a cast of good actors and Reiner’s ability to bring the authentic insecurities and moments of childhood to life through his talented young actors Flipped becomes a delightful coming of age tale that has enough charm and nostalgia to get you through its more average and tiresomely cliché creative choices.